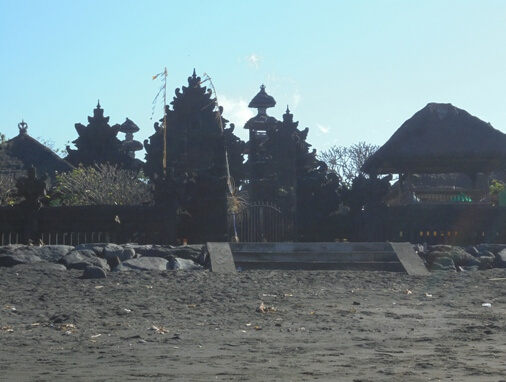 Watu Klotok Temple is situated on the edge of grayish black sand beach, hidden behind rice fields and canopy trees. This sacred temple has beautiful blue sea panorama, the Mount Agung as backdrop, and also direct view to Nusa Penida Island. You can enjoy a long stretch of glittering sand and occasionally gaze at the lush rice fields of the surrounding farming village. 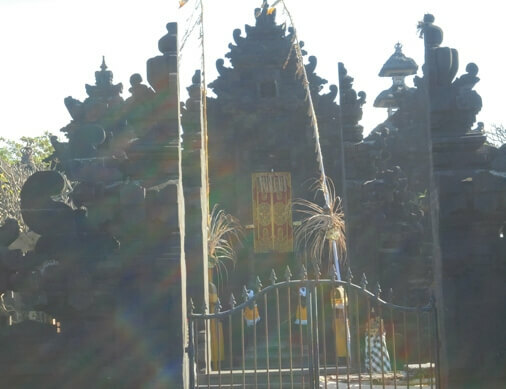 This holy temple is located in Tojan Village, Klungkung Regency, Bali. It is on the south side of the Jl. Prof. Dr. Ida Bagus Mantra. Take the Jl. 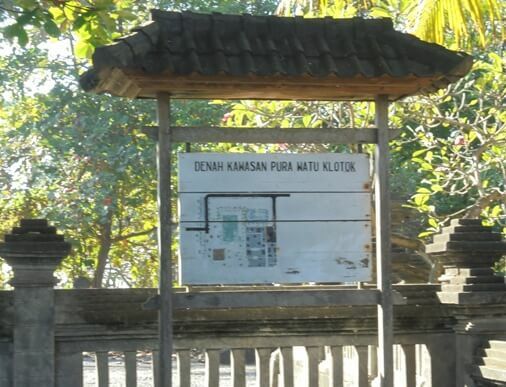 Pantai Klotok and you have found the beach also the temple. There is a large parking lot, also some food-stall on the beach selling food, snack and soft drink. Local residents are spotted collecting gravel stone on the beach, commonly called "batu sikat" and it is used to make pots or decoration on the floor. 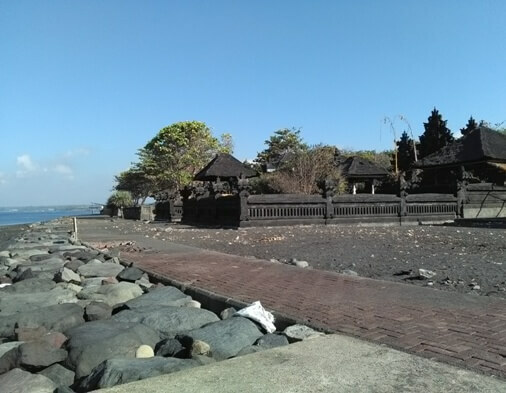 Here you can enjoy a serene atmosphere, a laid-back feel, as well as feel a unique experience of the holy temple with panoramic views of green rice fields, grayish black sand, waves and blue water, and magical sunsets. This temple has an important role for several rituals in Bali. During the ceremony such as the Eka Dasa Rudra and the Panca Wali Krama in Besakih Temple, this shrine became the destination of the Ritual Pesucian Ida Batara in Besakih and the Mulang Pekelem. In addition, some rituals are also performed here such as Melasti Ceremony, Ngangkid Ceremony, Neduh, Melukat (purification), and also for meditation to seek inner peace. This temple became one of the goals for Hindus to perform prayers. The pujawali is held every 6 months (in Bali Calendar) on Anggarkasih Julungwangi and every once a year on Purnamaning Kalima (Ngusaba Ritual). 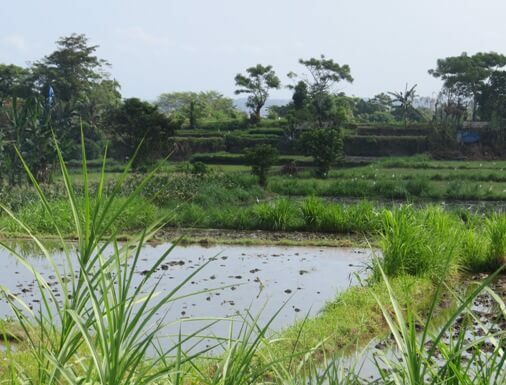 The subak groups who get the flow of water for the rice fields around the temple take the responsibility for the implementation of the Ngusaba Ritual. This holy temple is dedicated to Ida Sang Hyang Widhi Wasa to invoke for salvation and fertility for the wet and dry fields so that the harvest succeeds. When pests attack the plants, farmers usually ask for holy water for the safety of their crops in Watu Klotok Temple. Watu Klotok temple is one of the Kahyangan Jagat temples in Klungkung regency, South East of Bali. This sacred temple holds great spiritual significance and has a history that is closely related to the journey of the holy priests Mpu Kuturan. Even so, this temple is also believed to come from the megalithic era. Mpu Kuturan is one of the spiritual leaders who contribute greatly in the social order of Balinese society. He traveled to Bali and reached the Bay of Padang (Padang Bai), in 923 caka or 1001 AD. It was the reign of King Udayana, and the priest had a very important role at the time. It is mentioned in the manuscript of the Dewa Purana Bangsul that: He is Hyang Raja Kertha (Mpu Kuturan), coming to the southeastern seaboard named Silajong Watu Klotok, so called people, setting up temples for keeping ceremonies for lakes, bringing heavy rain, flowing the water giving life to all the vegetation for the soul of nature. Watu Klotok is derived from the word "watu" meaning stone and "klotok" which means to emit sound (mekocok). There is a story in the community about the discovery of the mekocok stone. This magical stone was brought and placed in a sacred place by the subak and afterward this sacred place is known as Pura Watu Klotok.